Kittehs have no trouble finding warm hide-outs. Does this count as a kitteh pile even though Kaia and Lu (on top) are not actually touching Emmy (inside)? Yes it counts!! 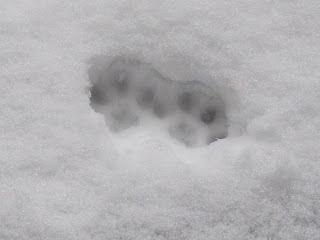 I so love the snow paw prints!! Poor cold little kitteh paws! I think this probably counts as a pile. I'd take it anyday. Actually I caught two of my little rottens sleeping on the same bed about a foot away from each other...that is a pile in my house. I'm guessing they're not enjoying the balcony these days. The few times we have had snow my four don't like to go out in it. They try to walk without getting wet and shake their paws trying to get the snow off. So funny to watch. Oh, I love the paw prints! How adorable! awww, what a cute little paw print. Sorry my comment is off-cat, but I wanted to alert people that in today’s HuffPo, Al Franken has an alarming article on how the U.S. FCC is now making rulings that threaten net neutrality for getting sites like this one on mobile broadband devices. The FCC is also not banning the “paid prioritization” that could let corporate blogs buy the fast lane, putting our sites in the slow. Love the kitty prints! And yes, that totally counts as a kitty pile! Those paw prints are so perfect!